I’veÂ had a love of AR-15â€™s since I was a kid.Â The first AR that I can remember shooting was in the early 90â€™s and it belonged to my dad.Â Fast-forward almost 20 years and it is still one of my favorite rifles.Â I build them and also repair them for my department. Â I’veÂ worked on Rock River Arms, DPMS, Bushmaster, Del-Ton, Spikes, and Colt. I have never been one to get caught up in the this brand is better than that brand argument mostly because I had never personally owned a factory built AR. All of mine were frankenguns and the closest I had got was the Colt that my department issued me.Â That changed after the election last year. I was looking for parts to build another AR and because the president finally revealed his true colors when it came to gun control the parts were once again hard to find.Â I had almost decided to give up and wait it out until parts were available. I changed my mind when I walked into my local Walmart and saw three ARâ€™s in the corner of the gun case.Â A little paperwork, and $900 later and I was being escorted to my car with a new SIG Sauer M400 tucked under my arm.Â I knew nothing about the M400 and picked it based the SIGÂ name and some of the features.Â After I got it home I learned it had a lot more features (some borrowed from the HK416 design) and was even happier that I went with the M400. SIG didn’tÂ re-invent the wheel when it came to the design of the M400, but they did add some features that I think really enhances it.Â When I first picked it up I noticed they added two QD sling mounts at the rear of the lower receiver.Â Being a QD sling user I like the idea of not having to add an aftermarket part to have this feature.Â Another addition to the lower receiver is an ambidextrous magazine release, which works very well and has a rather simple design. The last design change to the lower receiver is the addition of a spring-loaded pin at the rear of the receiver that allows you to adjust out any upper to lower movement. The remainder of the parts are basic AR and it comes with your average mil-spec single stage trigger that breaks around 6 lbs. 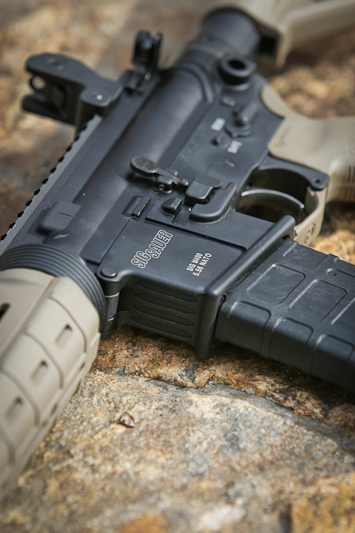 The buffer tube is 6-position mil-spec as well (some reviews list the buffer tube as commercial spec) and features a standard buffer.Â The upper receiver is your basic flat-top AR upper with T-marks and M4 feed ramps. The bolt carrier is a chrome lined â€œenhanced AR-15â€ carrier with a properly staked gas key.Â The â€œenhancedâ€ means the lower part of the tail section is longer than a standard AR carrier but shorter than the M-16 carrier.Â Some folks will tell you the M-16 carrier is better but I have seen no evidence to back up this statement and canâ€™t imagine those few extra ounces of weight make the rifle function better. Â The extra length on the M-16 carrier is only there for the auto sear to function correctly so itâ€™s not a necessary addition to a semi-auto weapon. The bolt is your standard AR bolt and according to the info I got from SIGÂ it’s MP tested but not stamped.Â The extractor features a black buffer and also an o-ring for more reliable extraction. I had a hard time finding accurate information on the M400 barrel and finally decided to go straight to the source and call SIGÂ and was provided with the following information on the barrel. The barrel of the M400 is cold hammer forged from chrome moly vanadium and features a chrome lined bore and chamber with a 1/7 twist and are all HP tested but not marked. I was also told the M400 and the 516 share the same barrel and in the case of the SRP model like mine they also share a similar gas block with the 516â€™s being modified for the piston system. Another feature of the M400 that was probably sourced from the HK 416 design is an extractor support pin located inside the barrel extension.Â This small pin supports the extractor in the event of a case failure or over pressurization and can prevent a complete blow out of the upper receiver. Living in the southern Appalachian mountains I have exposed the M400 to everything from snow to rain and even some freezing rain and so far it is running at 100% with no malfunctions of itâ€™s own to report.Â I’veÂ used metal mil-spec magazines as well as PMAGâ€™s and it has been flawless with both.Â Most of the rounds through my M400 have been 55 grain .223 rounds but I have shot some 55 grain and 62 grain 5.56 rounds and even a few 69 grain and 77 grain match rounds through it to see how it would function with various ammo types.Â Again it has been nothing but reliable and accurate. The M400Â isn’tÂ the most accurate ARÂ I’veÂ owned but in my opinion this gunÂ wasn’tÂ built with sub-MOA accuracy in mind.Â So far the largest groupingÂ I’veÂ seen from this rifle was just over 2 MOA at 100 yards with iron sights and 55 grain ball ammo. My smallest group came in at 1.25 MOA with 77 grain Federal Match ammo and a 3.5×10 Leupold MK4 scope mounted to it. There are a couple of things about the M400 (one specific to the SRP model) that I donâ€™t like.Â The first is the barrel profile.Â For some reason SIGÂ decided to use a profile that can only be described as Â¾ of a lightweight profile. It’s standard .750 at the gas block and then tapers down to a lighter profile before it steps back up a few inches before the flash hider. The other dislike specific to the SRP model is the gas block.Â Itâ€™s a huge chunk of aluminum and from talking with people who have removed it you will have to cut it off as it is pressed on the barrel and the pins are not easily removed. The SIGÂ Sauer M400 is definitely a gun to consider.Â For the price I donâ€™t think you will find another AR with all the features and reliability that the M400 offers.Â While it lacks some features that folks believe are important (M-16 carrier), it makes up for it by including features not found on other â€œmil-specâ€ rifles (extractor support).Â Itâ€™s also very accurate for a 16 inch carbine and is backed by a lifetime warranty from SIGÂ Sauer. I highly recommend the M400 to anyone in the market for a new AR. Nice review. 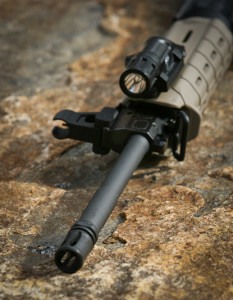 Can you tell me what flasklight rig that is on the handguard? Thanks! Sure hope to see the day that stock isn’t an issue, I am one who started to gather parts prior to the take over events and am hoping to finish mine soon. Great read, well written, thank you! I own 3 Sig M400E rifles and I can tell you that I’m very happy with them. (why 3? well, I live about 20 miles from the Epping NH Sig factory and I just cant resist going to the “toy” store once in a while, so my wife, my daughter, and my son all have their own AR now). I’ve (we’ve) run a couple thousand rounds through all of them without a single failure. I think it’s a great rifle for the money. My next purchase is going to be the Sig 716 Precision. I had the pleasure of shooting one the other day and I have to say, while it might not be a SCAR 17s, IMHO it certainly has a nice comfortable feel to it and the accuracy with iron sights at 100 yards was every bit as good as my SCAR, for about $1200 less. Speaking of which, if you have the opportunity to review a Sig 716 Precision, I’d like to read your thoughts about it. If I could convince SIG to send me one to reivew I would be glad to. I have plenty of .308 match ammo to play with and would even put it up against my 700LTR in a comparison. I was looking at the SIG M400 and the COLT LE6920 at the local Wal-Mart store and when the COLT arrived I scooped it up as the supply on both models had become very scarce. It was 6 weeks or so between when the SIG was sold minutes before I had the chance to get it and when the COLT showed up. I think both are fine examples of the AR15 platform…that being based on my VERY limited knowledge base though. I am not a big fan of the 556. I shot one right after they came out and really wasn’t all that impressed. If you want a rifle with a gas tube get the M400. If you want to stick with the piston guns then find a SIG 516. It’s on the AR platform but uses a piston system for operation. I would take the 516 over the 556 all day. The main benefit of the 556 piston driven system is that you can adjust the amount of gas coming back through the system. Traditionally this is useful in high round situations where carbon build up blocks gas flow and you need to continue firing. People will also say that the gas piston system is more reliable than the gas tube system. This is accurate if you are comparing a gas piston system to a vietnam era gas tube system. All of the kinks have pretty much been worked out of the gas tube system. I can personally vouch for the AR15 platform performing in very, very,very dirty environments, covered in mud and water. At the end of the day, the gas tube system wins out over the gas piston in my opinion. More parts available, easier maintenance, generally lighter weight. I own this same rifle. I recently installed a 15 inch rail on the rifle which required me to remove the gas block. It DOES NOT need cut off. I repeat, it does not need cut off. If you are any kind of a weaponsmith you will not need to cut this piece off. I have the intact original aluminum gas block from the srp in my closet. The model also has a wide lipped magazine well and ribbed front magazine well. The wider lip is something that usually requires an aftermarket piece and is used to facilitate finding the magazine well without taking your eyes off target. The ribbing on the front of the magazine well is a feature for mag well low ready users. Can you post some links to any parts or special tools you used. I want to install a 13″ alpha rail on my m400 SRP. First ar of mine. Don’t know what gas block will work and if I can get just any barrel wrench to remove the delta ring. Also any punches. I would really appreciate it. I installed a troy low profile http://www.amazon.com/s/ref=nb_sb_noss?url=search-alias%3Daps&field-keywords=low+profile+gas+block. A standard AR15 armorer tool such as http://www.cheaperthandirt.net/product/ARR-710?utm_source=GoogleShopping&utm_medium=organic&gclid=CIz_lcasqLsCFYg-MgodAV0A1g will remove any factory pieces on the rifle. I do not recall the punch size for the SRP gas block but if you line one up to see if it fits it should work. You will need to put it in a vice very securely, I suggest placing some pieces of wood in between the rifle and the vice, insuring that you don’t clamp down on any moving parts such as dust cover hinges or magwell. If the pins do not bang out heat up the area around the pins with a torch. Take care not to heat the barrel itself up too much. Cutting off the gas block is a no go. Period. The angle that you would need takes you too close to the barrel, you lose the gas block, and it takes forever to cut through. Once you get the gas block off you will understand why, It weighs about 1-2 lbs. You will notice a significant weight decrease. Even with a 15 inch troy alpha it is still significantly lighter than it was with a carbine length rail or stock handguards. Also, if you are installing a Troy alpha rail, it uses a clamp system to clamp on to the original barrel nut that’s on the rifle already. The one thing I really disliked about this rifle was the positioning of the QDC eyes. As close as they are to the safety lever it tends to get in the way with a more traditional rectangular QDC insert. A simple fix to this is to get a round ring QDC or make one yourself which is what I did. Other than that, fantastic AR platform. When I bought mine last November it came with a very nice soft side tactical case with the Sig Sauer name embroidered on. Very impressed with this package overall for the money. Thanks for the great review, I fully agree with your assessment. I’d like to address the “mil-spec” buffer tube. Some models do indeed have a commercial size tube, and some have a “Mil-spec” tube. I would suggest measuring with a caliper before buying a piece to replace the stock. I see no down side to a piston gun worthy of note. Nor do I have a problem owning a gas gun. I own both and both perform. I do have a problem with people who don’t know a hammer head from the handle passing judgement on weapons they don’t own, never shot or have a clue about.